Barack Obama’s second inaugural showcased a President who wants to mainstream Progressivism the way that Ronald Reagan mainstreamed Conservatism. President Obama is an extraordinarily gifted man. He accomplished far more during his first term than is generally acknowledged. Historians are likely to be more forgiving than the President’s supporters about his lapses in framing public debates and in negotiating with Republicans on Capitol Hill. The man who took the public oath of office on January 21st is wiser and more politically savvy than four years ago. He appears to be even more confident and resolved to tackle hard issues. My bet is that he’ll do better on Capitol Hill, and that Congressional Republicans will make it harder for their Party to win national elections in direct proportion to their success in blocking the President’s domestic agenda. President Obama’s second inaugural address had only scant and elliptical references to the challenges the United States faces abroad. More, of course, will be said during his State of the Union address about these challenges, including the nuclear issues that will intrude upon his second term. Mr. Obama mentioned not one word about nuclear dangers in his second inaugural address. Foreign challenges are more likely to diminish President Obama’s standing than domestic ones. There will be no end of fire-fighting in the second term. Relations between Israel and the Palestinians are a train wreck in not-so-slow motion. The Maghreb is in turmoil. Syria is a bloody mess. India and Pakistan are facing national elections. Mr. Putin seems in no hurry to take positive steps. North Korea has yet to reward presidential investment. Those who call for the complete suspension of Iran’s enrichment activities are not seeking a negotiated settlement. Even if President Obama were inclined to expend major political capital on these fronts, he would be hard-pressed to secure gains. With respect to Iran, he has no choice but to try. Where, amidst this disheartening foreign landscape might the President find significant potential upside in return for modest second term investment? In my view, the answer, in two words, is “China” and “space.” My argument is reprinted here from the January 7th issue of Space News. What are the prospects of a serious strategic engagement between Washington and Beijing, now that the U.S. elections are over and the leadership transition in China has been announced? Will talks over space and nuclear issues remain inconsequential, or is it finally possible to have meaningful discussions? Might it even be possible to break the ice with an agreement to cooperate in useful and dramatic ways? Starting a serious, sustained strategic dialogue would itself be a significant achievement. The United States and the Soviet Union avoided meaningful discussions for fifteen years by trading unrealistic proposals for general and complete disarmament. After the George W. Bush administration withdrew from the Anti-Ballistic Missile Treaty in 2001, Beijing and Moscow proposed a space treaty along these lines. Is Beijing now ready for more practical steps to help sustain the use of space as a global commons? The United States and the Soviet Union first engaged in serious strategic negotiations in the early 1960s. Back then, the focus was on nuclear testing in the atmosphere, which posed a public health threat to all nations. In 1963, Washington, Moscow and London negotiated a treaty to stop this practice. Today, debris in low earth orbit poses a public safety hazard of a different kind, threatening hundreds of spacecraft and human spaceflight, regardless of nationality. A treaty won’t solve this problem, but cooperation in debris mitigation techniques can help reverse this modern-day public hazard. Starting in the late 1960s, Washington and Moscow began to tackle negotiations on nuclear forces and national missile defenses, a dialogue that periodically produced treaties and that continues to this day. Washington and Beijing are unlikely to go down a similar path – at least anytime soon. U.S. and Chinese nuclear force levels are too disparate in size and capability for treaties. Beijing, like Moscow during much of the Cold War, is also averse to the transparency measures needed to undergird nuclear force reduction treaties. In the meantime, the strategic engagement that matters most between Washington and Beijing has to do with space. Both countries are already dependent on space for military and non-military uses, and will become more so. As David Gompert and Phillip Saunders have noted in The Paradox of Power (2011), in proportion to economic scale, China’s investments in space are already comparable to those of the United States. Investments in space, including the human space flight program in which the Chinese people take so much pride, are endangered by the proliferation of space debris and the absence of agreed traffic management guidelines for collision avoidance. Three debris events during the Bush administration – an anti-satellite (ASAT) test by the People’s Liberation Army, the break-up of a Russian rocket body, and the collision between a dead Russian and a functioning U.S. satellite – have clarified the need to establish norms of responsible behavior in space. The International Space Station has already had to be moved a dozen times to avoid debris hits. One U.S. response after the Chinese ASAT test was to demonstrate an agile, sea-based ASAT capability, doing so against a satellite about to enter the earth’s atmosphere so as to mitigate debris consequences. Another U.S. response, after the unprecedented proliferation of debris during the Bush administration, was to voluntarily provide warnings of possible debris hits to Chinese and Russian spacecraft. These conjunction warnings, generated by the U.S. Strategic Command and conveyed to Beijing and Moscow by the State Department, could evolve into a space traffic management system. Alternatively, military competition can heat up in space, including repeated instances of harmful, purposeful interference with satellites. The Pentagon will be ready for either eventuality. The key question is which path Beijing will choose. The Cold War competition between Washington and Moscow didn’t end with their strategic engagement. Instead, competition continued in some areas, but it was dampened by cooperation in space. Both superpowers retained vigorous military space programs, but they realized that it would be wise to refrain from highly provocative actions in space. To symbolize efforts to improve relations, President Richard Nixon and Soviet General Secretary Leonid Brezhnev agreed to an Apollo-Soyuz docking mission at the 1972 Moscow summit in which the first strategic arms limitation agreements were signed. Some feared that this mission would compromise the U.S. space program, while providing further rewards to the Soviet program. These anxieties proved to be overdrawn. In 1975, Apollo docked with Soyuz, and U.S. astronauts and Soviet cosmonauts dined together in space. 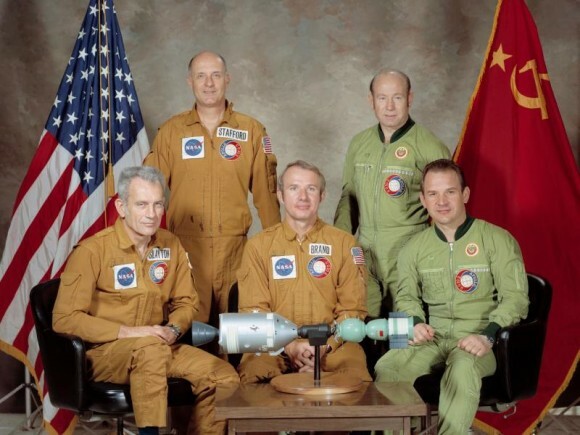 The Apollo-Soyuz mission established practices of cooperation in space between Washington and Moscow that continue to this day on the International Space Station. One way to swing the calculus of the new Chinese leadership toward increased cooperation with the United States would be to propose a joint U.S.-Chinese space mission of some kind. Similar offers could be made to India, Russia, and other space-faring nations. Options might be particularized by space scientists for consideration by national authorities. The menu of choices for U.S.-Chinese initiatives will face similar concerns as with the Apollo-Soyuz mission. It could also serve the same purposes. A substantive strategic engagement with China on space will be very hard for the Obama administration to pull off. The level of mistrust between Washington and Beijing is high. Territorial and resource disputes around rock outcroppings in the South and East China Sea could freeze any warming trend. Some in Congress will continue to oppose fiercely any cooperation with China in the space domain. By necessity or choice, U.S. Presidents in their second terms often become practitioners of small steps rather than strategic initiatives. Beijing’s newly elevated leaders may also be overly solicitous to the PLA leadership during this transition period. Despite all of these significant constraints, cooperation in space is a powerful idea. Especially for a U.S. President who doesn’t appear to want to play small ball for the next four years. The only crewed spaceflight capability the US *might* have during Obama’s last term will be commercial (SpaceX, Boeing) capsules flying to the international space station. So a cooperative program might be using one of those, if they’re successfully put into service, to visit a Chinese Tiangong space station with a reciprocal visit by a Shenzhou capsule to ISS. —-Is this the “taking the nukes off hair trigger alert” reform people havebeen arguing the US should do? –Obviously it would be the UK’s version of it, not the US version of it. FORMER defence secretary Lord Browne believes the UK should stop deploying nuclear submarines around the clock. The Labour peer said yesterday that nuclear weapons should play less of a role in defence strategy, arguing Britain should “step down” from “continuous at sea deterrence (CASD)”. The view, expressed in a House of Lords debate on nuclear disarmament, is at odds with the UK Government’s insistence on updating Trident with an identical replacement. The SNP said last night that the comments created confusion around Labour’s nuclear policy and added weight to the argument for independence.